A 45-year-old female complained of a painless swelling, which had developed in the epigastric region, and was slowly growing in size over the last one year. The patient had undergone excision of a similar swelling at the same site seven years ago and was now facing recurrence. 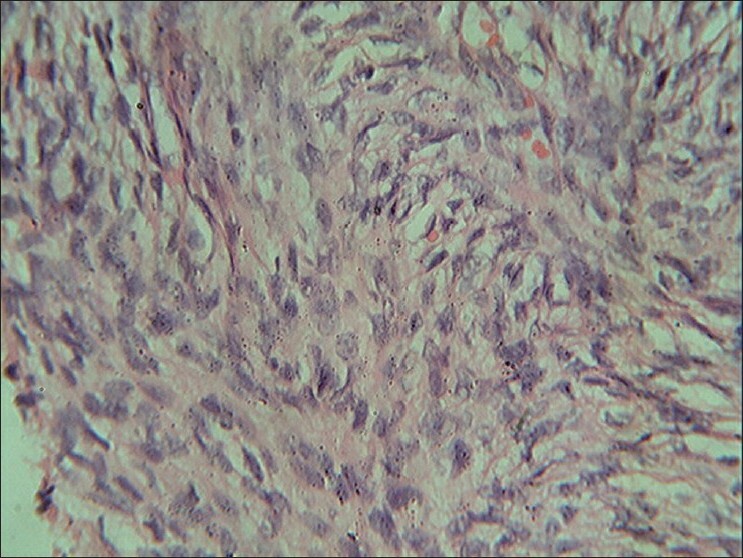 Histopathology and immunohistochemical (IHC) examination confirmed the diagnosis of Dermatofibrosarcoma Protuberans. The most common soft tissue tumour of the abdominal wall is the desmoid tumour while the least frequent is the Dermatofibrosarcoma Protuberans. Dermatofibrosarcoma Protuberans (DFSP) is a rare, indolent, low-grade sarcoma recognised for its progressive locally infiltrative nature. A painless, long-standing, slow-growing subcutaneous nodule remains its most common form of presentation of this disease. It constitutes less than 0.1% of all cutaneous malignancies and 6% of all soft tissue sarcomas. The incidence has been estimated at 0.8 cases per million persons per year. Metastasis is rare but if it occurs almost all metastatic cases have been associated with local recurrence and a poor prognosis. Early diagnosis, wide excision and regular follow-up are indicated for DFSP. A 45-year-old female came to the hospital with chief complaints of recurrent swelling in the epigastric region since one year. The swelling was initially small in size, nodular gradually increasing in size and had currently achieved the dimensions of about 5 Χ 5 cm [Figure 1]. The swelling, which was earlier painless, had now become painful after it ruptured with a bloody discharge. The skin around the swelling was retracted and shriveled in appearance, which was consistent with past history of wide excision with split thickness skin grafting seven years back. Clinical parameters were within normal limits. Chest roentgenogram was normal. With the provisional diagnosis of recurrent DFSP the patient was taken up for surgery. The patient underwent a wide local excision of the mass. The tumour involved rectus sheath, rectus sheath and part of rectus muscle with margin of 2.5 cm was removed. Same margin of 2.5 cm was taken in all directions [Figure 2]. The defect was covered with split thickness skin grafting. No intra-abdominal extension of the tumour was found. Microscopic examination revealed elongated spindle-shaped cells arranged in sheets, tiny nodules, storiform pattern with pleomorphic, hyperchromatic or vesicular nuclei with 2-4 prominent nucleoli and moderate amount of eosinophilic cytoplasm mixed with histiocytes [Figure 3]. The pathological diagnosis was DFSP, which was confirmed by immuno-histochemical examination. Immunohistochemistry showed that tumour cells were positive for CD34 and XIIIa. Recovery was uneventful and patient was discharged on the fifth post-operative day. Patient is asymptomatic one year after surgery and is coming for regular follow-up. Soft tissue sarcomas are mesenchymal neoplasms comprising 1% of adult malignant tumours. Among the soft tissue tumours, abdominal wall tumours are uncommon, accounting for less than 5% of these neoplasms. , Historically, this neoplasm was first described by Taylor, in 1890, but Hoffman coined the currently accepted term when he reported three cases in 1925. Chromosomes 17 and 22 has been incriminated in the aetiopathogenesis of DFSP. There is translocation t(17:22) involving COL1A1 (collagen type 1a1 gene) and PDGF b (platelet-derived growth factor) genes respectively. , The tumour first appears as a single, red to bluish, blanchable, firm, cutaneous nodule. During the late stage, rate of growth accelerates, producing the characteristic protrusion from the skin. The growth rate is variable. Lesions may remain stable for many years or they may grow slowly with periods of accelerated growth. Local recurrences occur in 20-55% cases. There are conditions that can mimic DFSP, which should be considered in the differential diagnosis. They are: dermatofibroma, epidermal inclusion cyst, keloid and hypertrophic scar, malignant melanoma and metastatic carcinoma of the skin. We would like to thank Dr. H.R. Tata, Head of the Department of Surgery and Medical Director, for allowing us to publish this data. We are also thankful to Mrs. M.C. Deshingkar from Surgery Department Office for her help in preparing this paper. 1. Stojadinovic A, Hoos A, Karpoff HM, Leung DH, Antonescu CR, Brennan MF, et al. Soft tissue tumours of the abdominal wall: Analysis of disease patterns and treatment. Arch Surg 2001;136:70-9. 2. Mc Peak CJ, Cruz T, Nicastri AD. Dermatofibrosarcoma protuberans: An analysis of 86 cases- five with metastases. Ann Surg 1967;166:803-16. 3. Khatri VP, Galante JM, Bold RJ, Schneider PD, Ramsamooj R, Goodnight JE Jr. Dermatofibrosarcoma protuberans: Reappraisal of wide local excision and impact of inadequate treatment. Ann Surg Oncol 2003;10:1118-22. 4. Brennan MF. Staging of soft tissue sarcomas. Ann Surg Oncol 1999;6:8-9. 5. Sjφblom T, Shimizu A, O'Brien KP, Pietras K, Dal Cin P, Buchdunger E, et al. Growth inhibition of dermatofibrosarcoma protuberans tumours by the platelet-derived growth factor receptor antagonist STI571 through induction of apoptosis. Cancer Res 2001;61:5778-83. 6. Kiuru-Kuhlefelt S, El-Rifai W, Fanburg-Smith J, Kere J, Miettinen M, Knuutila S. Concomitant DNA copy number amplification at 17q and 22q in dermatofibrosarcoma protuberans. Cytogenet Cell Genet 2001;92:192-5. 7. Shrimali R, Garg L, Setia V, Jain S. Dermatofibrosarcoma protuberance (DFSP)-CT findings in DFSP-a rare skin tumour. Indian J Radiol Imaging 2002;12:357-8. 8. McArthur GA, Demetri GD, van Oosterom A, Heinrich MC, Debiec-Rychter M, Corless CL, et al. Molecular and clinical analysis of locally advanced dermatofibrosarcoma protuberans treated with imatinib: Imatinib target exploration consortium study B2225. J Clin Oncol 2005;23:866-73.